Little Kharter Sullivan | Kind.Fund: Crowdfunding and fundraising for personal causes and charities. 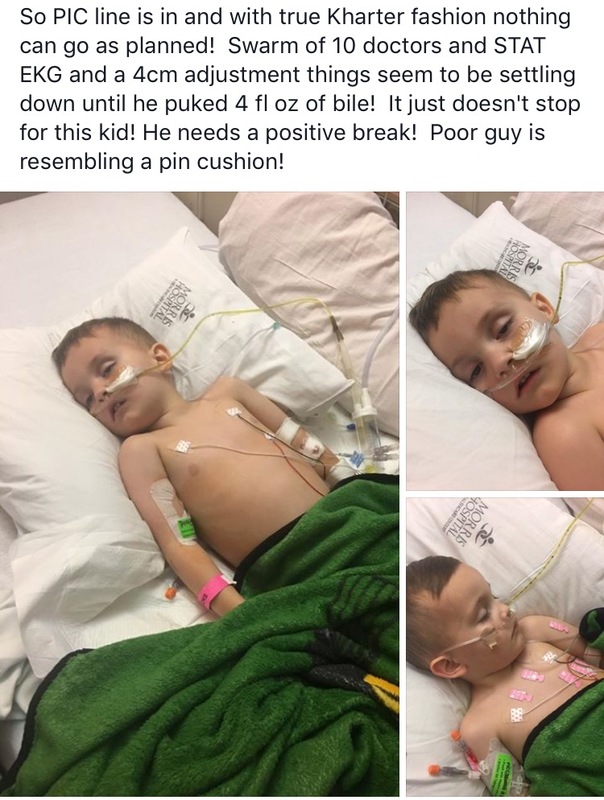 Sorry to hear of this! Praying for your family! Loving thoughts and positive vibes to Kharter and your family during this difficult time. 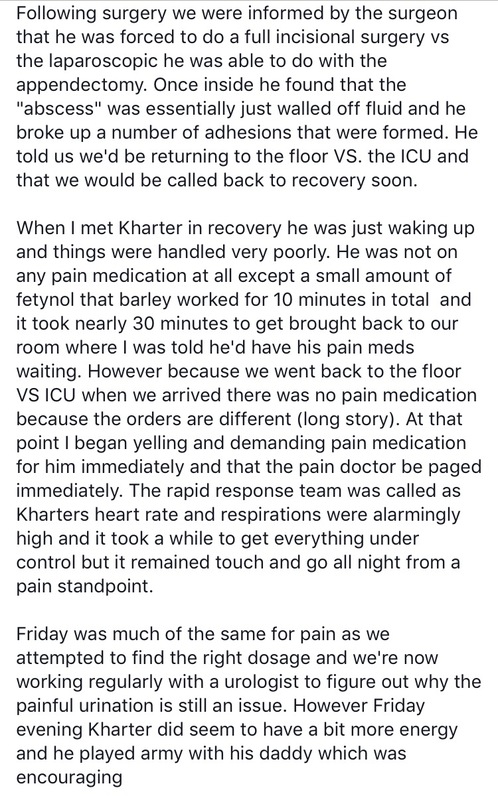 Tamatha and the clerks at the Boone County Circuit Clerk's Office are thinking of you all and hope Kharter gets to go home soon to start recovering. We are praying for Kharter and the Family..Stay strong and we love you guys!!! 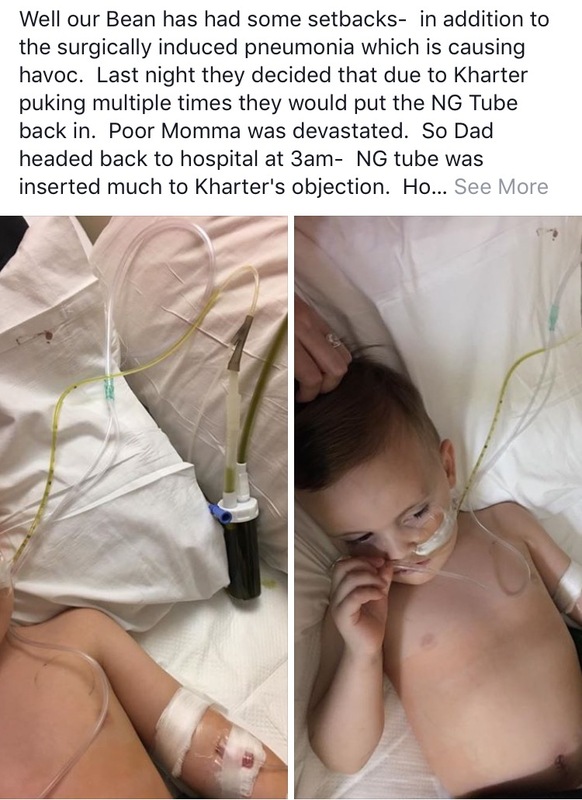 Very sorry to see this happening to Kharter and the difficulties you all are enduring. Prayers continue for you all. Love and prayers your way! I don't have much but maybe this little bit will at least help you get to your goal. I will repost Kharter's KindFund on all of my Facebook pages. I love you Boss and Sullivan families. My prayers are continual with you and little Kharter. I am praying for you all. God is holding little Kharter. I love you my family. I wish you were closer so I could visit. Keep strong and God will provide. 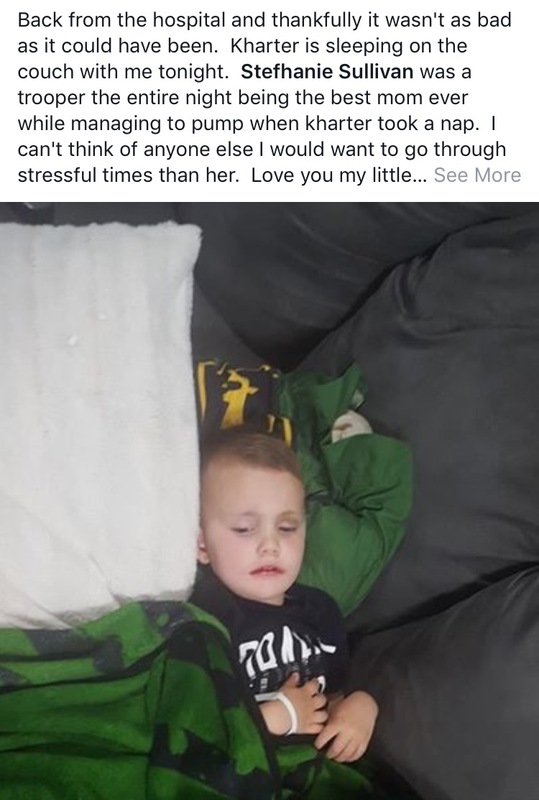 So sad for our little bug. Love you Bean. 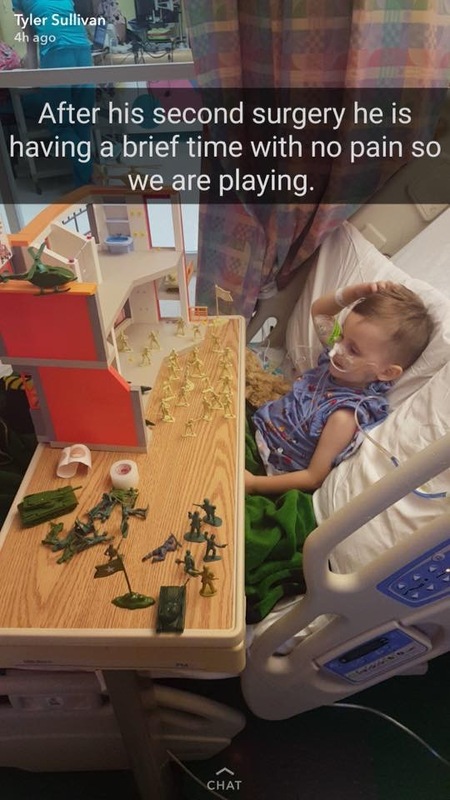 You are the toughest kid I know. Keep staying strong. 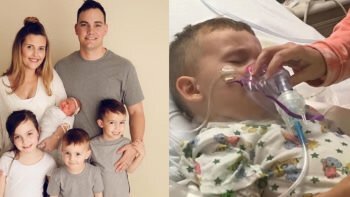 Bless this special family and amazingly strong little bean! Both Garth and I pray this will be over soon and he will be home with his family. 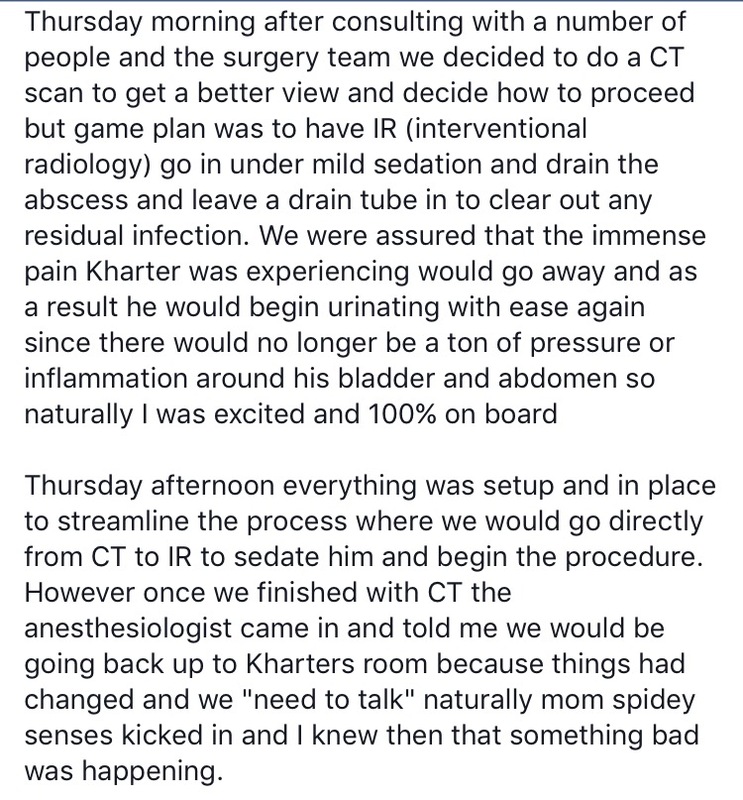 After spending some time in the PICU and a couple of touch and go days in terms of pain and symptoms we're cautiously optimistic that Kharter is ready to turn a corner! Kharter continued to spike fevers throughout yesterday due to the blood infection but appeared to be making progress in terms of his abdomen which appeared to be flat and soft and he was tooting and hungry which he hasn't been in a couple of weeks. 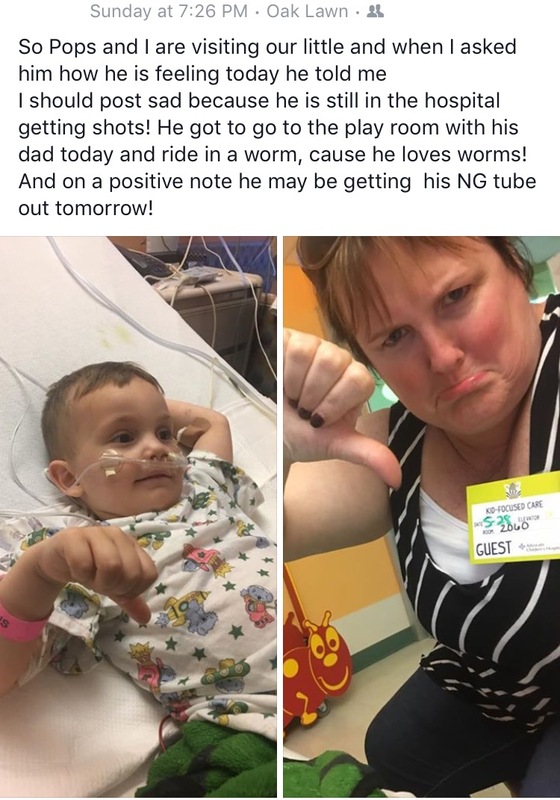 His NG was placed on gravity for 24 hours and at 5pm last night doctors ran contrast through his NG and crimped the top. 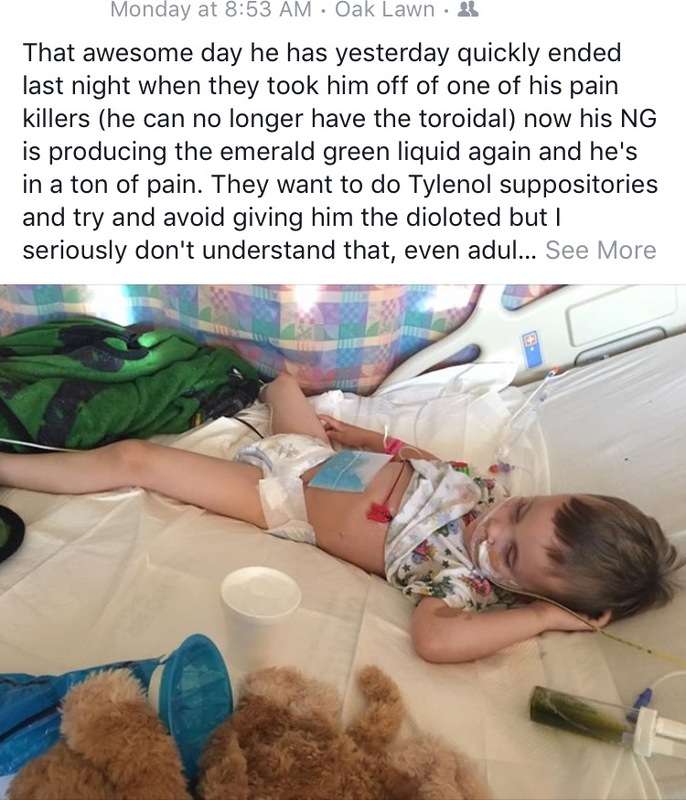 At 5 am this morning an X-ray was done to see if the contrast was able to flow all the way through his colon and if it did the NG would be removed, if not we'd wait another 12 hours and check again. 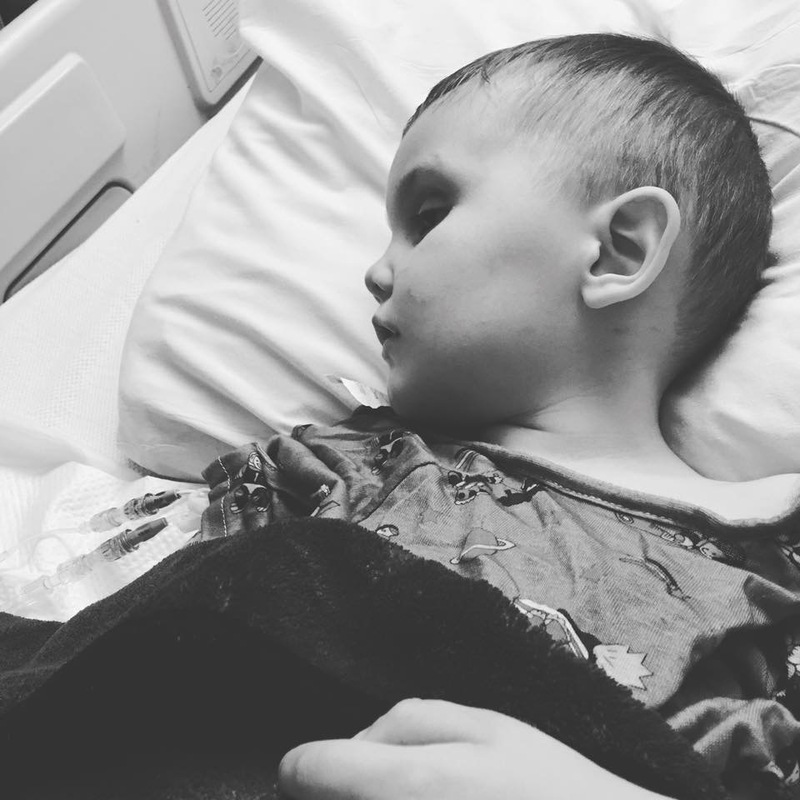 Thankfully god heard our prayers and answered them and the contrast made it to and through Kharters colon in 12 hours or less and as of 8am the NG was pulled and Kharter has been allowed to eat some apple sauce and chocolate milk (and we snuck him a bite of a muffin!) 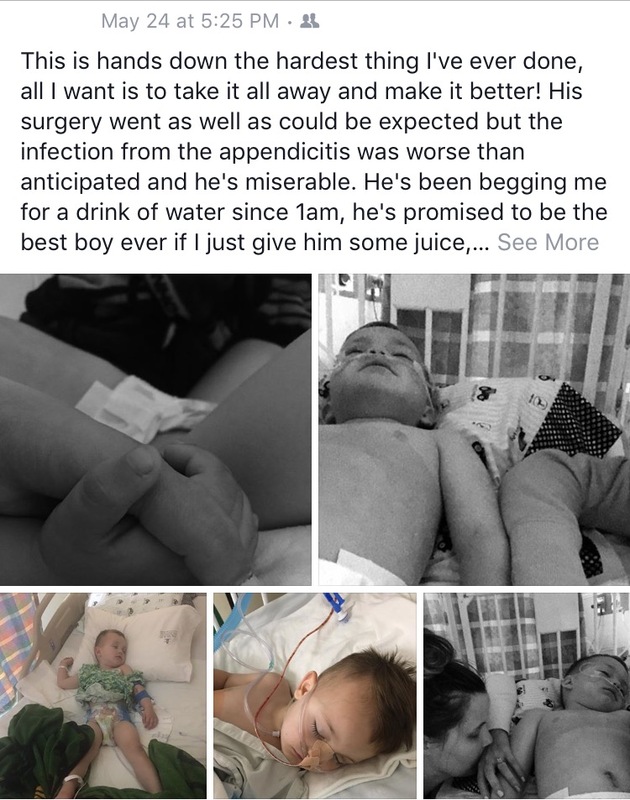 he's still in some pain abdominally but it appears the blood infection is being treated appropriately and responding well to medications and we continue to pray that now that he's able to begin eating again after 20 days without food he'll have the strength to get up and be more physical and come home within the next 4-7 days! 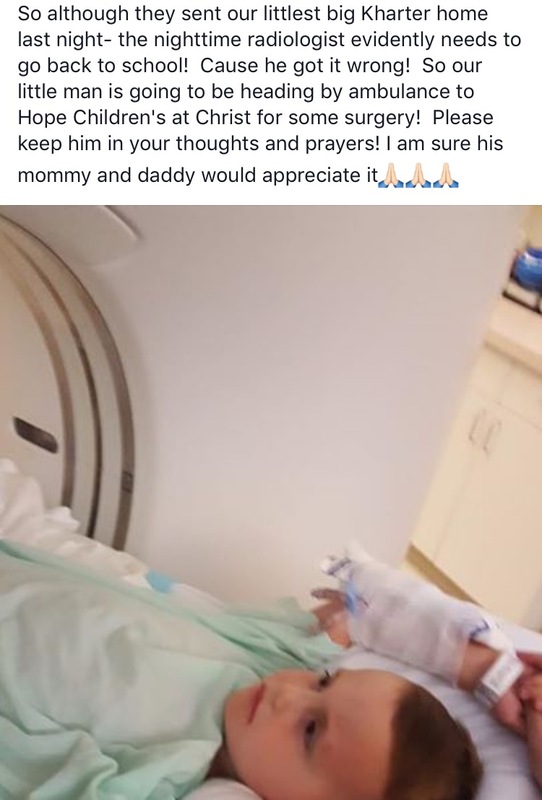 Thank you for your continued support and love and being patient with us on updates we're so blessed to have you and Kharter is blessed beyond measure for all of your love and prayers! Firstly, the outpouting of support, shares, & prayers have been and continue to be heart-warming and truly powerful. In just a few days, you all have raised over $3,300 for Little Kharter & family ❤ You are all appreciated and loved and your support is heart-warmingly uplifting! 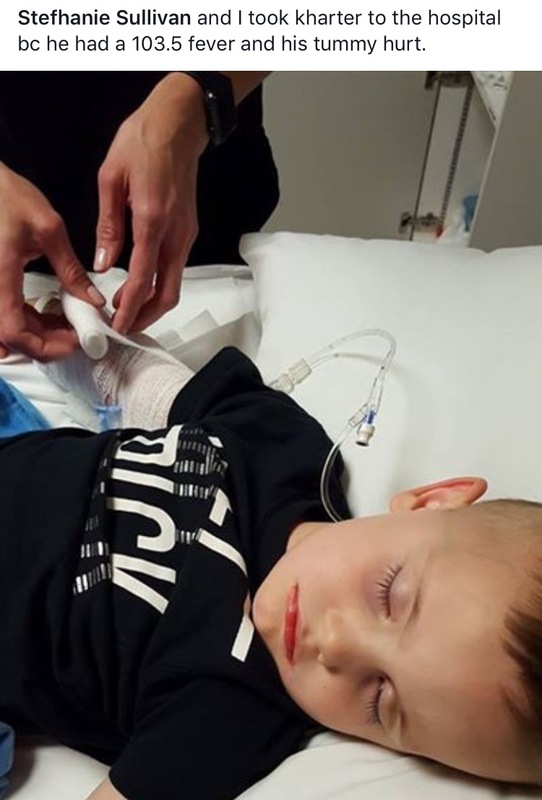 Little Kharter & family are facing another set of challenges, as Kharter has been transferred to the PICU. The family and his medical team or focused on managing the unrelenting pain he is experiencing. Kharter is one of 4 corageous, strong-willed, & loving children in the Sullivan-Boss family. 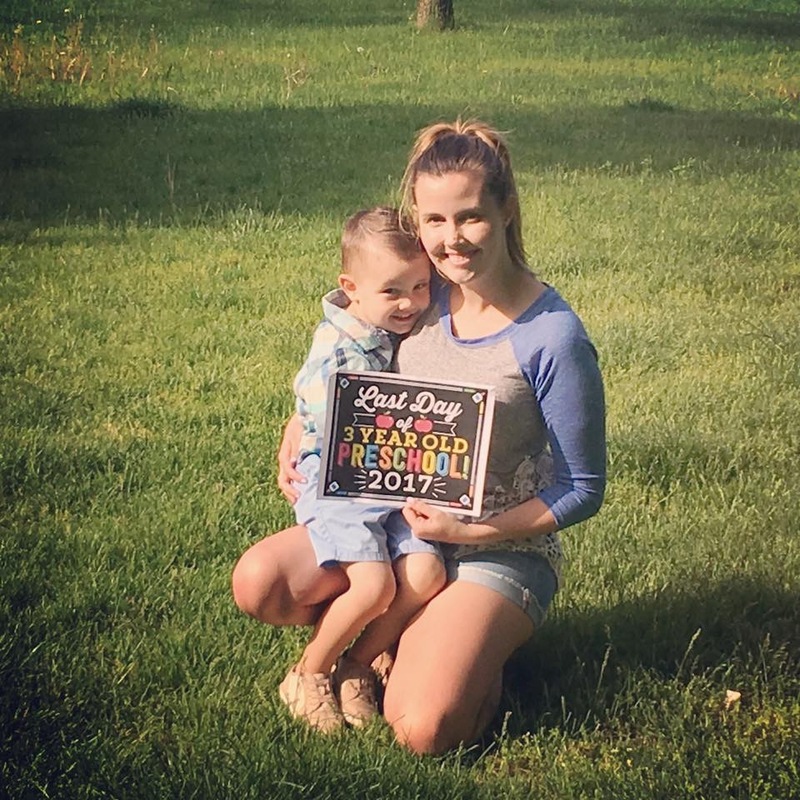 Father, Tyler, Mother, Stefhanie, and the entire family just celebrated his graduation from 3-year-old preschool! On May 22, 2017. 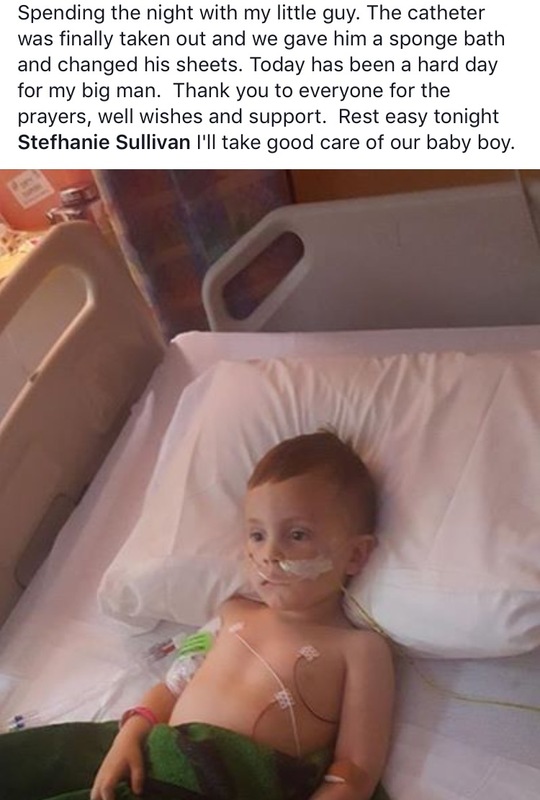 One of the biggest battles The Sullivan - Boss Family has faced began with a fever and a stomachache. At first, Little Kharter seemed to have a bit of a bug. The Sullivan - Boss Family were sent home. But a mistake landed him straight back in the hospital. His emergency surgery went well. Though it was hard for the Sullivan - Boss family to see their Little Kharter in pain & hungry, they comforted him. Things seemed to be taking a turn for the better, but Little Kharter had some setbacks. And Dad stayed with his Little man so that Mom could try to get some rest & spend time with their newest little. 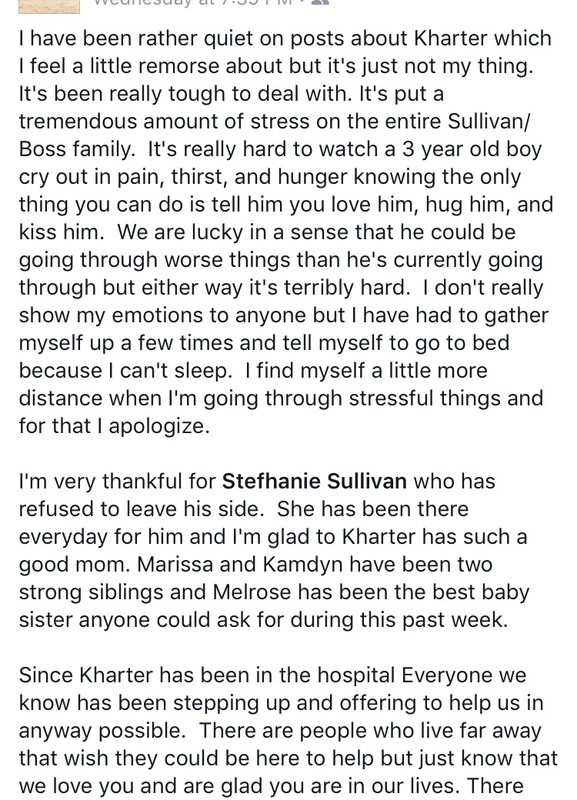 With love ❤️ and support from the entire Sullivan - Boss Family (who were doing everything they could to support and advocate for Little Kharter while balancing work & 3 other little ones at home) & friends, things seemed to move in a positive direction! 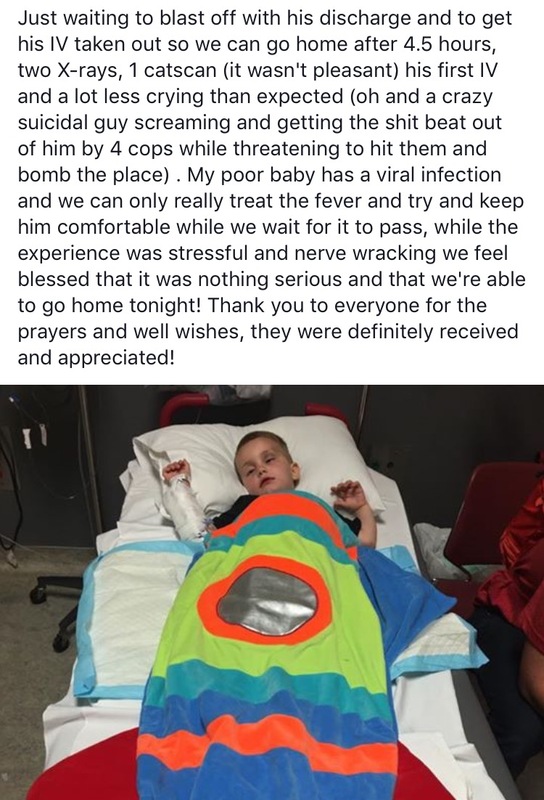 And these incredibly strong parents needed answers, thanking everyone around them for their support in a great time of need. Dad & Mom, a rock solid team deserving of the title, did the best they could to foster hope & support as they waited for answers. you can't tell in this photo that every part of my heart is broken and that I have no idea what to do, but that's exactly what this is a picture of..."
And those answers came, in the form of another emergency surgery. 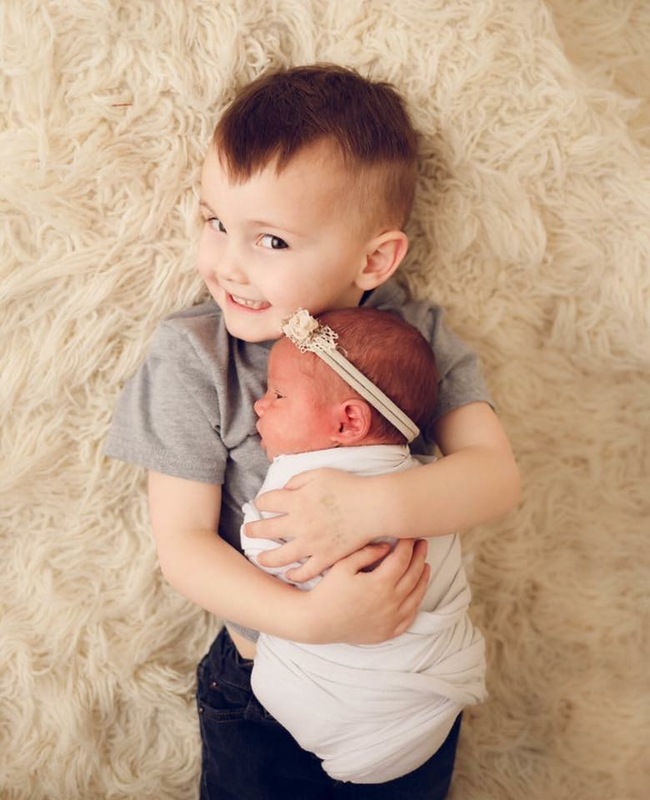 Through all the setbacks, The Sullivan - Boss Family and Little Kharter (aka Bean) have held each other together. But, they need YOU to help keep holding them up, so that they can continue to focus on what's important, being the rocks that Little Kharter and the rest of their littles need & love so dearly. ❤️ This amazing family has been through thick & thin together (and I have had the joy of knowing them through it all). Every donation, no matter how small, will help them face the challenges that lay ahead of them & will go toward medical & recovery costs for Little Kharter & the family.